As the end of August drew near it was time to say our goodbyes to Australia. Our last port of call was Darwin in the Northern Terrority. Boy were we nervy anchored in the harbour there dreading an attack from the famous salt water crocadiles each time we boarded our small tender. The harbour police tried to settle my anxiety my ‘reassuring’ us that so far in 2013 they only counted 210 crocs in the harbour!!! The day we arrived a local lad had been killed by one in a nearby river!!! Full on!! The Aussies are just sooo “supercool” about such things, no more than they are about their snakes and sharks! And speaking of which we had plenty of those to keep us occupied on our next passage…..
Six tentonic plates meet in the SE Asia region, the Indo-Sinian plate, the Philippine Sea plate, the Pacific Sea plate, the Indo-Australian plate, the Australian plate and the Indian Ocean plate. This complex patch of water is know as the ‘shallow seas’ of the Sunda Shelf, which is made up of various seas all of which are less than 200metres deep. This is certainly the worlds largest area of continously shallow water. The Timor sea, between Australia and Indonesia is part of this shelf. Our chart looked like it had hundreds of roller coaster tracks on it with deep ocean trenches and well ploughed furrows in between. The chart itself wasn’t particularly acurate. There was all sorts of sealife on route to Indonesia, from salties (crocs) to sharks and sea snakes galore. A fasinating passage, for sure! And as with all our passages into, out-of and around Australia we had a flying visit from the Australian Border control. Unreal! You think you’re in the ocean all on your own and next thing a plane flys by low beside our yacht followed by a call on VHF channel 16 with various security questions. Impressive! The Indonesian Archipelago has 13,677 islands (6,000 of which are inhabited) making it the largest island group in the world. It is the worlds 5th most populated country with 240 million people. Indonesians speak more than 757 languages!! This sprawling archipelago certainly has the richest and most vibrant culture we have seen so far. It is steeped in history and heritage and was certainly the most interesting country to arrive to by sea.. Sea life continues today much the same as it has for centuries, I don’t think the local boats have changed at all, sailing amoungst these beautiful traditional wooden boats certainly felt like a voyage back in time. As usual on arrival we had to clear customs and emmigration. Normally this involves 3-4 officials boarding the yacht and going through the necessary paperwork along with sealing our alcohol supplies, and sometimes checking what fruit and veg we have onboard from a biosecurity point of view. In Kupang we didn’t have 4, not even 5,6 or 7 onbaord….. 20+ ‘officials’ boarded LUSH!!! Paul had hoped he’d be able to run through the paperwork ashore but they insisted on all coming out to LUSH!!! And when we offered them the norm soft drinks, tea or coffee they asked for beer!! At the end of the day we have to do what they want in order to get our paperwork allowing us into the country. We kept them all in the cockpit, only allowing 4 of them below deck to inspect LUSH. The rest were happy-out drinking beer and taking pics. You know as with everything on this trip you just have to embrace the moment and go with the flow, so we entertained our guests and had a good oul laugh with them all, singing songs, dancing, giving them some of our famed Red Bull tshirts etc.. etc.. till we acquired the necessary stamps! From Kupang, (East Timor), we sailed onto Labuanbajo on the island of Flores to reprovision and prep before Eddie and Marie rejoined LUSH. This place was a noisy hive of activity with people, scooters and cars and dust everywhere. It was a far cry from the tranquility of the Pacific islands thats for sure. I had great fun stocking up on my fruit and veg at the market where I had to barter for everything. I traded with sun hats, caps and the Red Bull tshrits, along with a few packets of seeds for differnt herbs from back home. The latter fetched me some quality groceries in fairness! They take cash too but rathered exchange for tangible goods. What an experience! My Aunt and Uncle, Eleanor and Kevin Moran, joined us for a week cruising the Komodo National Park. They are both good friends of Eddie and Marie’s and they were actualy the ones who had recommended EJ to employ us back in 2011. At that point Paul and I were back in Ireland, Paul running his sailing centre Sailing West along with motivational speaking and high performance coaching, and I was working as a dentist. My Aunt never knew I harboured the ambition to sail around the World she just knew we were passionate sailors and that Paul had done alot of work for Oyster before setting up his own business. So Eddie did his research on us and next thing we get a call of him offering us the job, which we hadn’t even applied for!! He wasn’t to know this was an ambition we both had since we were kids but in fairness there’s not many people who would turn down a job like this! Komodo is famous for it’s Komodo dragons, the largest recorded was 3metres in length and weighing over 150 kilos. The islands have around 3,000-4,000 dragons and you need a guide with you when you go ashore to see them. We went for a decent hike though one of the islands with a guide and on stopping for a snack a dragon came out of nowhere, charging at us for some of my famed flapjacks. They have killed humans so we were pretty nervy and glad to see the back of him after our guide scared him off witha rather large stick! From Komodo we cruised up to Sumbawa, anchored off a luxury resort had a stunning 5 star BBQ on the resort beach, chilled out for a couple of days before sailing onto Lombok. We had plenty of wind during our time in Indonesia with a lovely seabreeze building by 11am each day and calm anchorages when the breeze droped in the evening. Lombok is another hidden jewel of Indonesia, with pristine white beaches on a mountanious backdrop and fishermen everywhere whether standing in the water with their nets and rods or sailing solo on little sail-fishing boats along with literally thousands of other boats. Out of everything I’ve ever seen on the water my whole entire life the sight of these boats was truly extraordinary. I am not exagerating when I say there were thousands of them off the coast of Lombok, all dugout cannoes with stablising arms and the most colourful sails with one fisherman in each. They go out to sea on the last bit of evening breeze, staying offshore fishing throughout the night and then returning with the seabreeze by mid morning. Lombok isn’t the easiest place for anchorages and we first tried to anchor off the Gilli islands, beside it, but with wind against tide this was untenable and so we followed a local cruising boat into the most perfect of anchorages (which hadn’t been mentioned in our pilot book due to the amount of reef around it). It was surrounded by a semi circle beach know as Sire beach with two of the best resorts in Lombok either end of it. We must have been in this anchorage for 10 nights, and while we ventured off to the Gillies etc during the day we couldn’t help but return at night. Each morning the sun rose over the top of Mount Rinjani and the morning mist would burn off. The fishermen were in the water chest deep fishing and smiling, always smiling! We ventured ashore for organic spa treatmants like no other and spicy local cuisine in the hotels. Bali fully lived up to it’s reputation as a rich, vibrant and spirtual country. From a sailing point of view though there’s not much you can do as there are no safe anchorages and only one marina on the island. Somewhere that’s famous for surfing is unlikely to be suitable for anchoring a yacht safely, you can imagine why. We parked LUSH up for a few days and ventured inland to sample it’s world famous culture and as with everywhere else in Indonesia it didn’t dissapoint. 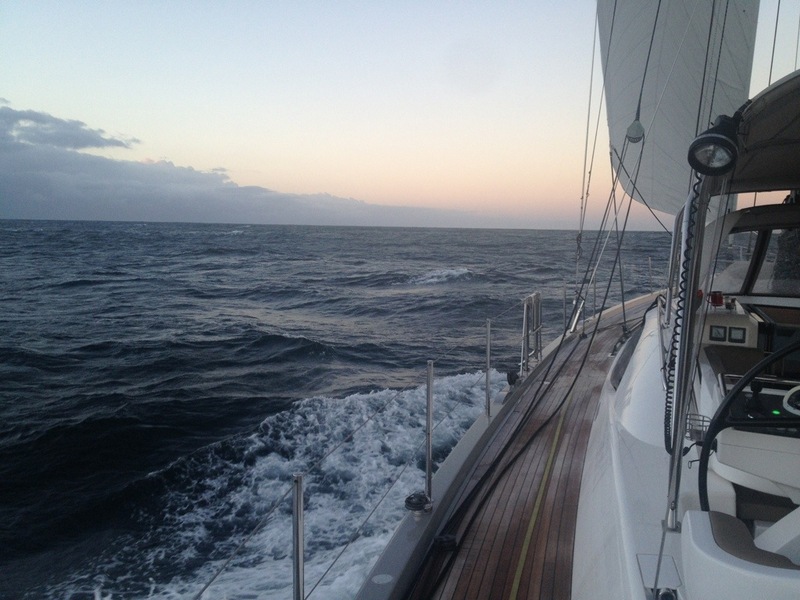 We prepped LUSH for our next offshore passage acrose the Indian Ocean and set our sails for the Coco islands. One Life… absolutely lived and breathed it in Indonesia and it’s top of my list for somewhere to return to in future. Even after 6 weeks there I felt we only got a small taste of what it and its people have to offer! The tectonic plates of Timor Sea! Audrey’s aunt & uncle Eleanor and Kevin Moran, good friends of Eddie and Maries, enjoying a week onboard the mighty LUSH! Massive thanks to them that we are here! Komodo Dragon! Looks alot bigger and more scary in the flesh! Loads of the most colourful local sail-fishing boats! Local fishermen, chest deep in water! Paul with LUSH safely at anchor in the background. Beautiful anchorage all to ourselves as usual! 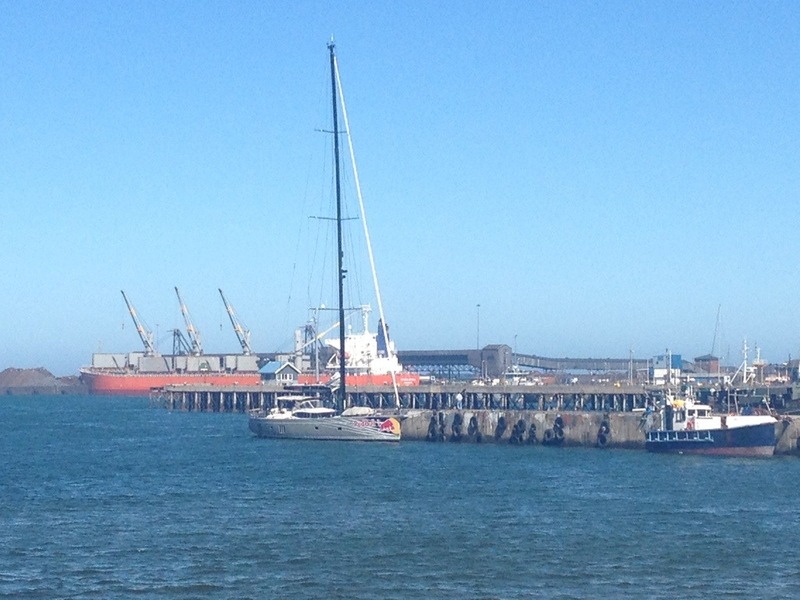 The wind looks great and we have just left port Elizabeth!! We are expecting a big easterly blow tomorrow so Alan was checking our reef pennants for chafe! All great onboard and bring on the Cape of Good Hope!! Safely tucked up waiting for a SW hooly!! We are bound for port Elizabeth….So beers tomorrow night in PE!! 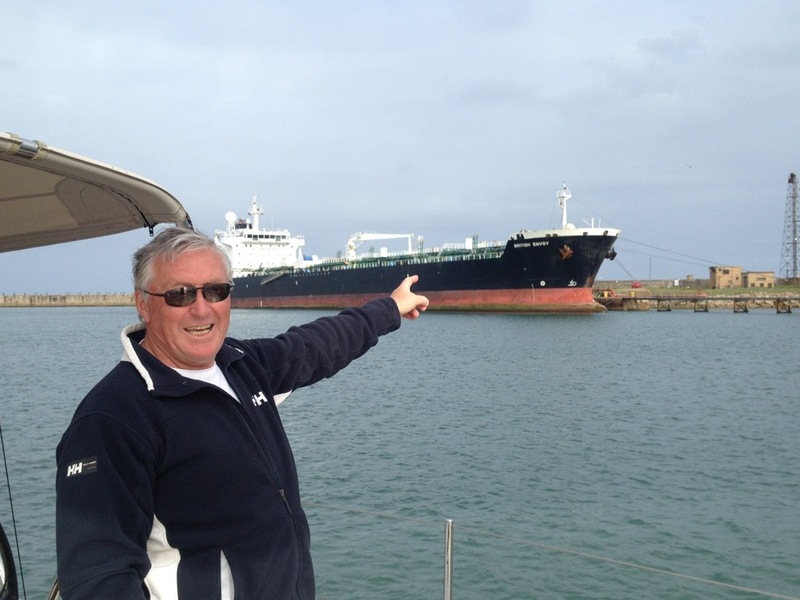 We thought you guys would like this video where Paul explains about how we tackled the famous Agulhas Current! By the way, for you guys that know Paul…that TASH is for MO -vember! He promises it isn’t a permanent feature!!! “Whooooaaaaaaaaa.. Oh my God!!!!! 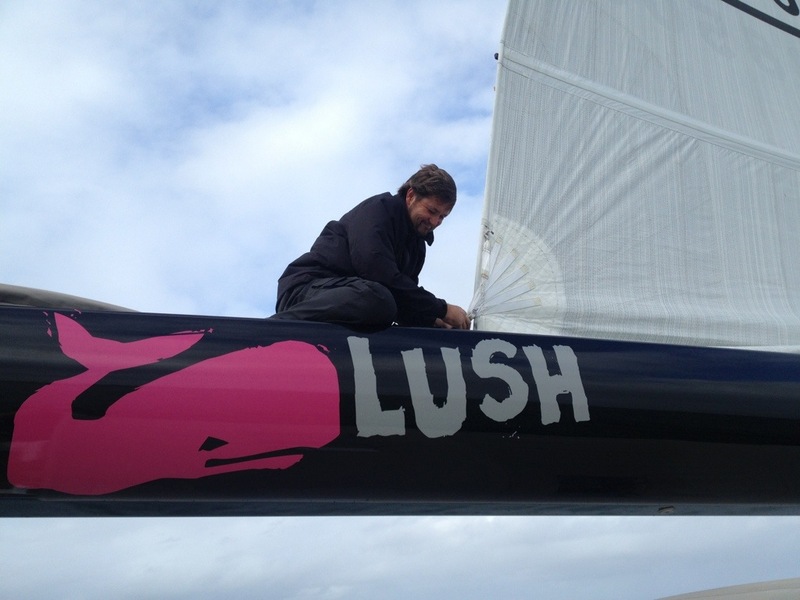 !” as 2 massive black and white humpback whales breeched clear of the water no more than 20 boat lengths from LUSH!!! They momentarily hung in the air and our jaws dropped whilst we observed one of the many wonders of our oceans! Humpback whales grow to 15 meters (50 feet) and weigh up to 40 tons!!! The rest of team LUSH arrived on deck in a hurry and was privileged to witness another 3 breeches! During this time.. our adjectives were colourful to say the least as we were in complete awe of these magnificent creatures!! They swam with LUSH no more than 5 boat lengths off her port quarter and escorted us on our course to Durban for around an hour and a half. They flipper slapped, tail slapped and also emerged with a massive sky hop to take a look at us!! Now wildlife photography is a challenge! Especially when you want the camera to take a picture NOW!!! So during all of this I was randomly shooting the camera and got some nice shots and we have a video of the sky-hop! It is really hard to articulate what a special moment this was to us all onboard so I’ll let the pictures do the rest!! Wherever you are, whatever you are doing, whoever you are with.ONE LIFE…make sure YOU’RE LIVING IT! Chef shows the lads how it’s done! So… I’m on watch and the fishing line starts to run. I called the lads from their bunks but none of them heard me, so there was nothing for it but to slow the boat down quickly and reel in the line. 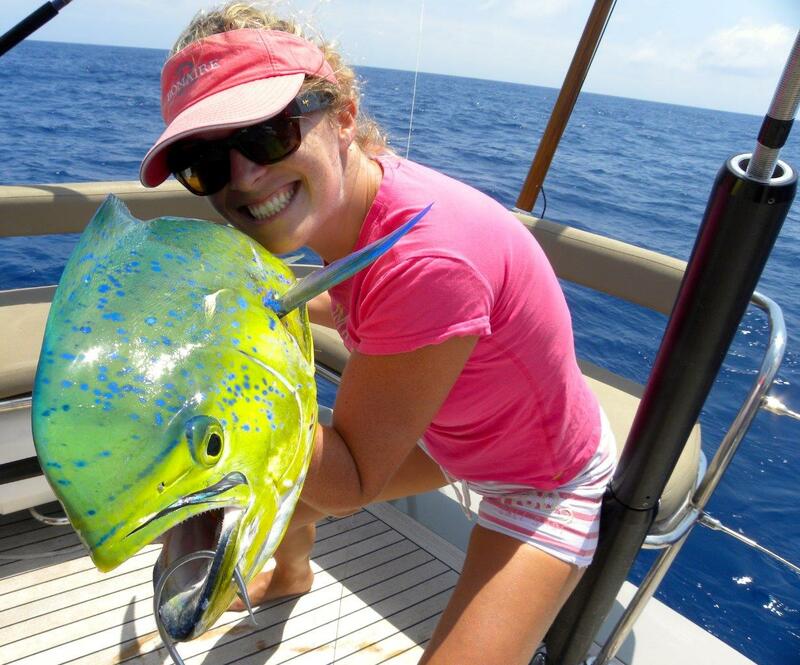 I hooked an absolutely beautiful Mahi Mahi (or Dorado) and I pulled it in as quick as I could. Wow, such fun!! I can’t believe I’ve left it to the lads all this time to catch and land the fish. 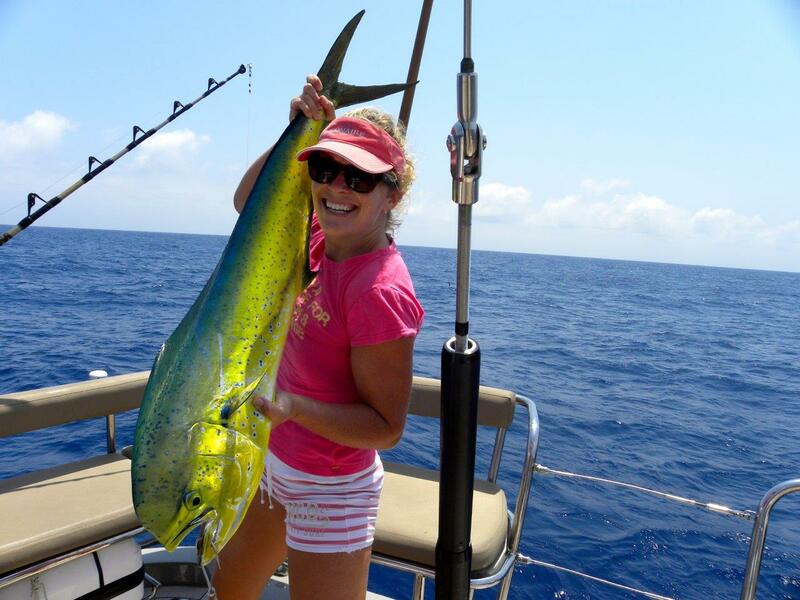 They arrived on deck to see the most stunning Mahi Mahi yet and a very happy chef indeed. 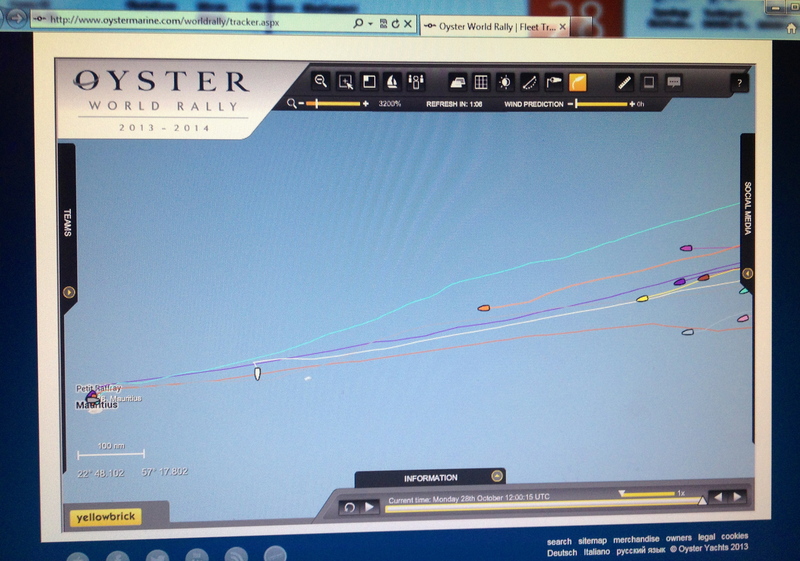 There’s a competition amongst all the Oysters in the fleet to see who catches the biggest fish on this circumnavigation. Sure, what sort of competition is that? Surly it should be based on the tastiest and prettiest fish caught? And in that case I reckon I must have the winnings?! Also maybe a competition for prettiest fisherman too? I hardly broke a sweat pulling this in! Don’t know what all the fuss is about!! 😉 No points for guessing what was on the LUSH menu tonight! And boy was it as tasty as it looked! Pure delicious! And now for the Fishing score.. Boat 3 – Fish 3!! 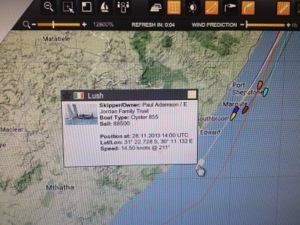 Still all to play for with 5 days to go before pulling into Durban. We’re sitting in very little wind at the mo and expect it to stay like this for the next 24hrs until a Southerly of about 30knots hits! Freak Waves, a 6 knot Current and Antarctic lows ahoy! After some serious trekking, mountain climbing and canoying in the magnificent French island of La Reunion the Lushous crew are at sea once more. This is the passage we’ve been most concerned about since planning our circumnavigation. The most popular route for circumnavigators throughout the century has been to sail up through the Suez Canal and into Europe. Unfortunately this route is no longer a safe option due to Pirates on the East coast of Africa, especially Somalia. Now as I’ve mentioned on previous posts the further west you sail in each ocean basin the more weather you’ll encounter. Certainly this proved to be the case between the Caribbean and Panama (North Atlantic), and between Vanuatu and Australia (South Pacific) and now in the Indian Ocean we expect the same only this time there are a few more factors to consider. The weather in the vicinity of the southern tip Madagascar is “often unsettled” due to the extended continental shelf just off the coast and the splitting of the South Equatorial Current which gives a contrary current of around 1knot. “Confused seas” are often reported in this area. 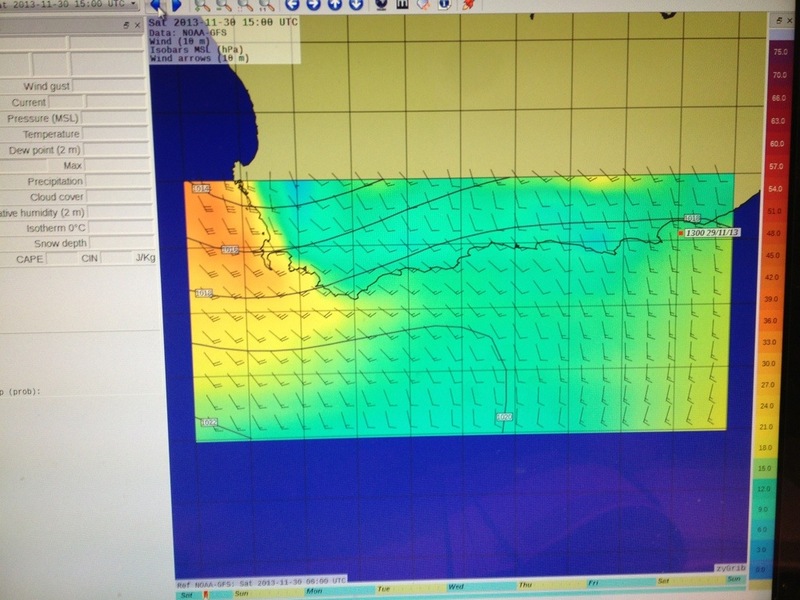 We’ve been sailing around 100miles offshore to avoid these seas and potential freak waves! The South flowing Agulhas Current contains waters from the Mozambique Current and waters from the southern branch of the Equatorial Current. This current flows South and then strongly South West before passing the Cape of Good Hope. It can be up to 6knots in strength, which if the wind is favorable means we could potentially do an extra 144 nm per day sitting in the current. The problem with this current is that on this stretch of coast you regularly get fronts (every 2-3 days) bringing SW gales and creating extremely dangerous seas in a wind against tide situation!! Waves of 70ft plus in height have been recorded here! With this in mind we paid serious attention to the long range weather forecast in La Reunion. 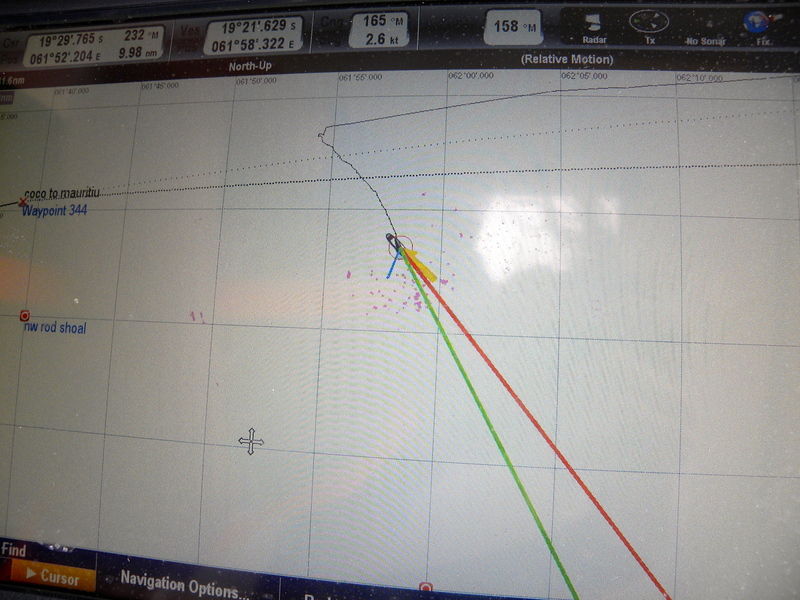 A good few of the Oysters in our fleet left a day or two before us however looking at the prediction of weather due by the time we’d reach the east of South Africa we felt it better to leave on Saturday 16th. We really don’t want to be off the coast of Africa with a SW gale in force and the Agulhas current running at 6knots south!! Ideally we’d like to sail directly to Cape Town however this is unlikely due to the regularity of the fronts and looking at the forecast from here we’ll be pulling into Durban and waiting for a weather window to sail further south. The other option is to stay outside the Agulhas current all the way down, however there is a high chance of being caught by a deep low coming up from the Southern Ocean going this way, so we’ve opted for the coastal route. According to Jimmy Cornells book on World Cruising Routes the local method of forecasting a SW buster is (as one might expect) to watch the barometer. When it starts falling the winds will be NE. Once the barometer stops falling the wind becomes light and then ceases altogether. The moment it starts rising, you have between 30 to 60mins before the arrival of a SW gale, which will be the warning for us to leave the 100 fathom line quickly, and head for the coast, as this is where the Agulhas current can become hazardous. Obviously before all this we’ll be keeping our usual eye out for the changes in cloud with Cirrus coming in from the west followed by banks of cumulus before the approach of the cold front where the wind will back slowly from E to NW freshening all the time and the followed by the SW gale. Remember we’re in the Southern hemisphere so everything is the opposite way around to the North! So here we go heading towards one of the Worlds most dangerous stretches of ocean where monster waves lurk and potential of ‘wind over tide’ conditions are of epic proportions. We’ll let ye know how we go but for now looks like we’ll get through ok. Fingers crossed! LUSH Celebrates her 1st Birthday! A year ago today LUSH was handed over to Eddie, Marie and crew. Wow what a year it’s been, from packing the boat for the world trip in Southampton to then setting sail a week later on our World Adventure. Here we are in Mauritius (Indian Ocean) over 20,000 nautical miles later and as you’ve all, no doubt, gathered from this blog it truly has been the trip of a lifetime!! LUSH has looked after us extremely well on this voyage and is still in superb condition ready for oceans and weather to come! We are just about to leave Mauritius and set our sails for the French island of Reunion, less than a day’s sail away. No 1. The people are extremely helpful and generous (everywhere we went they’d give us something for free). I have not experienced such generosity as this from so many people in one place, whether it was the taxi driver giving me a bag of mangos or the waiters giving us free drinks, food etc. They’d always give you something extra. Love it! No.2 It’s cheap! Even in the 5 star hotels, ie champagne cocktails for less than 5 euro! No.3 The supermarkets are fantastic!! You just can’t beat the French islands when it comes to food especially meat and cheese! Gosh, I was like a kid in a toy shop!! And the great news is there’s more to come… bring on La Reunion!! Monster Marlin wins after 7-hour battle! 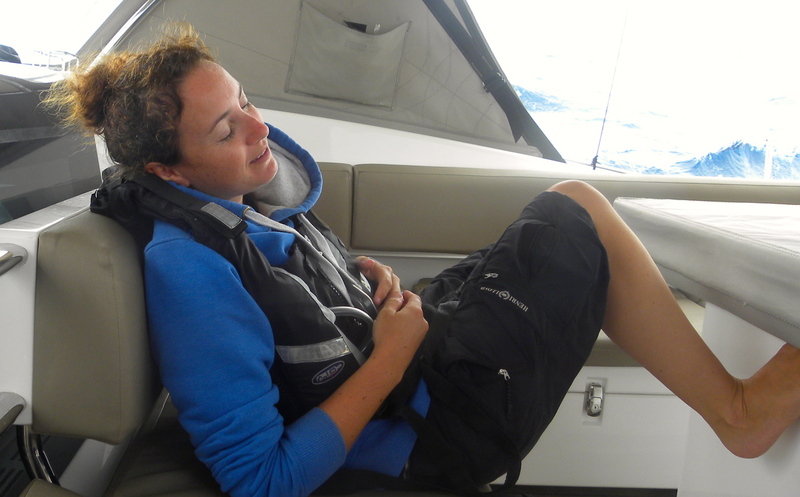 After 10 days at sea we’ve arrived safe and sound in Mauritius with LUSH and all her gear still in tact…. well all her sailing gear at least. As for the fishing kit… now that’s another story!!!! 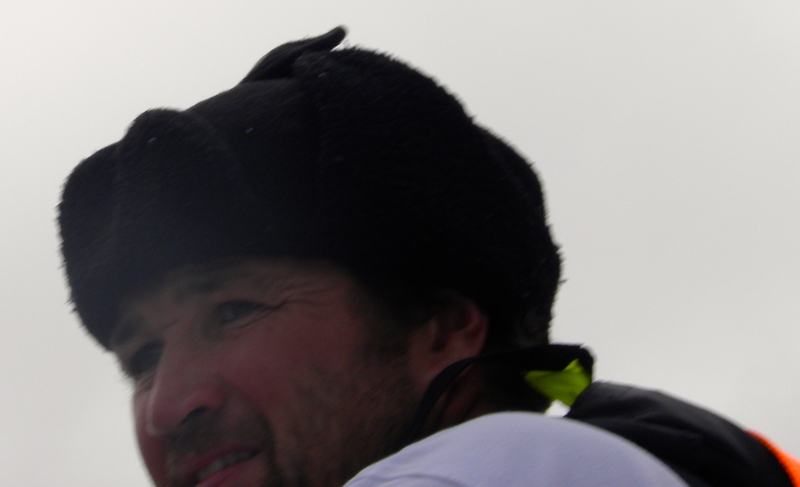 8.30am on Monday 28th Oct Paul and I woke on hearing the headsail furl and our engine turn on. Alan was on watch. This could only mean one thing… we’ve hooked something! We quickly joined him on deck to help slow the boat down. The fishing line was flying out of the rod at a serious rate of knots, Alan shouts ‘this is a big one, slow LUSH right down!’ There may be a word or two missing from that last quote! Paul steered her up into the wind and Al started to pull on the reel, the fish leapt from the water about 50metres behind LUSH….. it was a SERIOUSLY MASSIVE MARLIN!!!!! 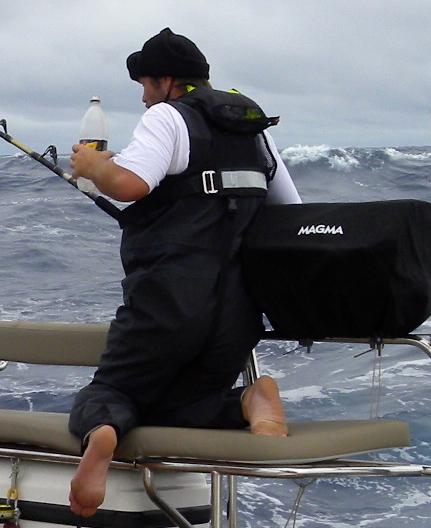 Normally when marlin jump they get a load of slack in the line to then pull against and break. To date we’ve lost all the Marlins we’ve hooked from this stunt so there was no way the lads were gonna let it happen again. Al reeled in the slack quickly, keeping the tension on. Pretty much all the line was still out so we knew we had a bit to go to get this in. With a fierce amount of pull on the line Al had to work hard, he was sure “this is the one for us, we have him, just have to take our time and play the line”. “Play the line”??!!!……. one hour goes by…. then the next… then the third and Al is still “playing the line!!!!”. Lucy is on deck too and the two of us are starting to wonder will this ever end? The more time we spend with this Marlin the longer it will take us to arrive in Mauritius and the more likely we’ll experience rougher weather, which was forecast. Meantime, Als hands are glued to the rod and Paul is steering LUSH keeping our fish to leeward and under tension. Al shouts out that the fish is coming close and soon to surface by the back of LUSH. The three of us gather round our fisherman and peer over the stern. Oh boy what a sight we beheld…….. it was a monster, the biggest fish I’ve ever seen in the flesh (besides the humpback whales). With all the diving we’ve done on this trip I haven’t seen or come close to anything as big. ‘Twas a Marlin alright, stunning electric blue, purple and aqua green colours on its underside with a seriously long bill (sword/spike above his mouth). He must have been 12 foot long, and folks ye can trust me when I say that, I find us girls tend to have a more accurate and honest judgment when it comes to size! Now this length doesn’t include the bill, which was prob another 3 foot on top of that! And there he was, 4 meters away from LUSH. Als eyes widened, his grip tightened, this was a battle he intended to win, he wasn’t letting this deep ocean beast out of his hands now. After 20,000 miles this was the closest we’d come to landing a whopper…. He clutched the rod tightly, no way could any of us come between him and his fish. Al figured the Marlin had plenty of energy yet and said he’d need a bit longer to tire the creature out. His birthday was a day away and skipper granted him his wish, even if it was to delay our arrival into Mauritius by a day. This was looking likely as we had to get in before dark the following day or wait till first light the day after to enter Port Louis under harbour regs. Another hour with this fish, really meant another 12hours for us at sea on top of the time spent reeling him in!!! Lucy and I looked at each other rolling our eyes thinking the lads are in deep now and they just won’t give up. The forth hour goes by, then the fifth and I’m seriously getting frustrated, “come on Al, get the blinking thing in”. 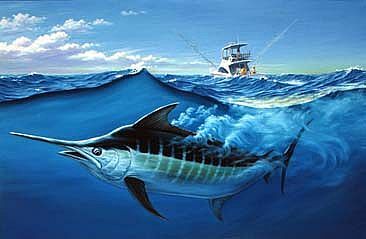 Al just continued to tire the fish, letting the line out and then reeling him back in, recalling fishing lore such as Hemmingway’s Old Man and the Sea when it took Santiago three days to tire his marlin out!!! I was getting impatient telling Al to get it close and we’ll put a noose in the end of the halyard feeding it down to our marlin around the fishing line. In fairness it isn’t as easy as that, not with a fish this big and aggressive. 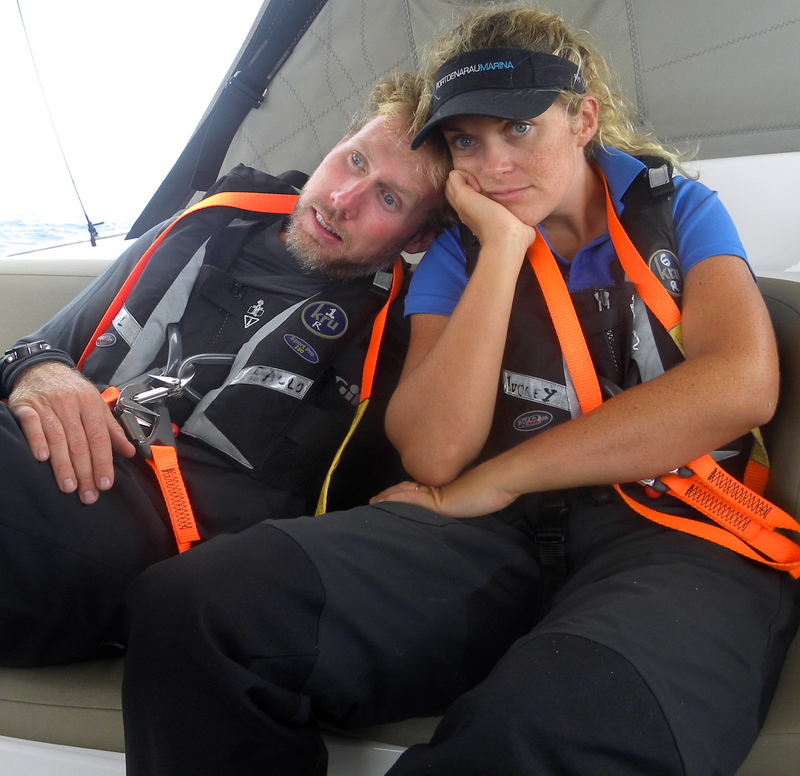 Al was right, we needed to fully tire him out before we could bring him onboard. What would we do with him once onboard was still a bit of a mystery! The sixth hour goes by with much the same battle as the previous five. We had suggested to Al on numerous occasions to take a break and put Paul on the rod but this was a battle Al wanted to fight on his own. I’m guessing that’s some type of masculine, animal type testosterone thing that I will never understand. And finally the seventh hour….. There was no sign of Als powerful pelagic giant caving in and by now it had pulled the mighty LUSH 20miles off course in a seemingly inexhaustible display of strength. I still don’t know how the rod is still in one piece, it practically bent all the way back on itself from the pressure. 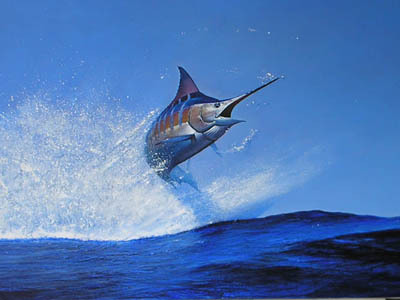 I’m not sure about Indian Ocean Marlin but certainly the Atlantic Blue Marlin is a threatened species and must be released if caught within 200miles of the US. Sports fishermen catch them, haul them onto their boat, take the pic etc and release them. The survival rate of released fish is low because of damage during capture. So really it’s a good job we never got the beast onboard. What Al felt at that moment we can probably all only imagine… there’s not many of us who would take on such a fight let alone stay at it for that length. One thing is for sure HE HAS A STORY, which really is what we all have at the end of the day, just this is one that will endure. 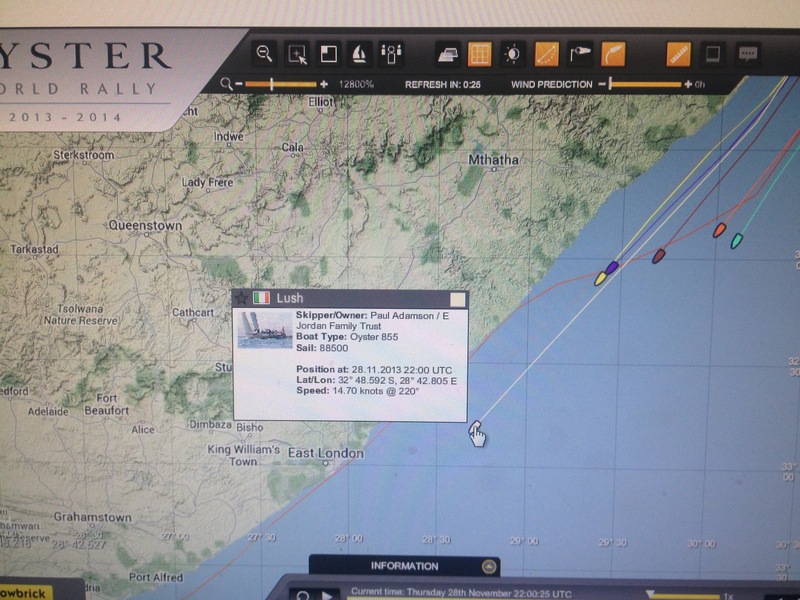 Once Al finished his battle and record attempt we then had Skipper on a mission to compete his record and get this boat into Mauritius within 10days. 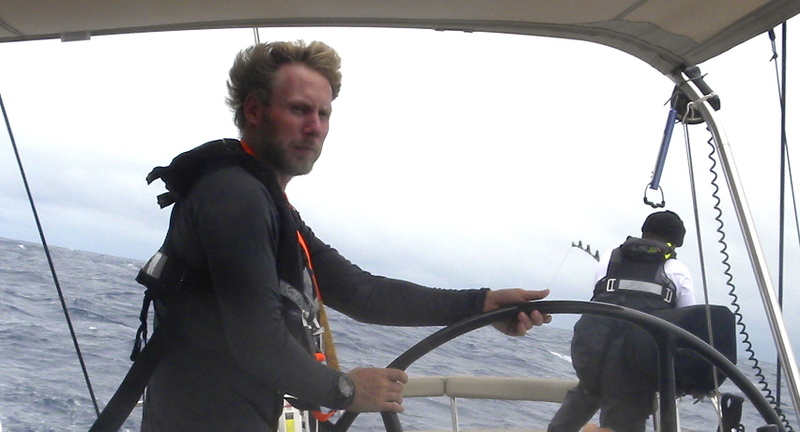 We threw the third reef into the sail and put LUSH back on course. 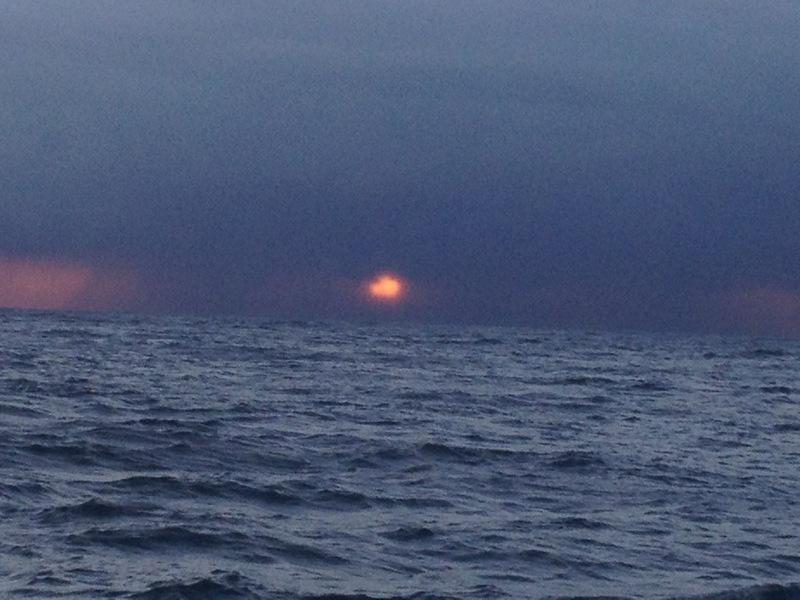 As darkness fell the wind picked up to about 35-38knots, with seas building we knew we had a long night ahead. 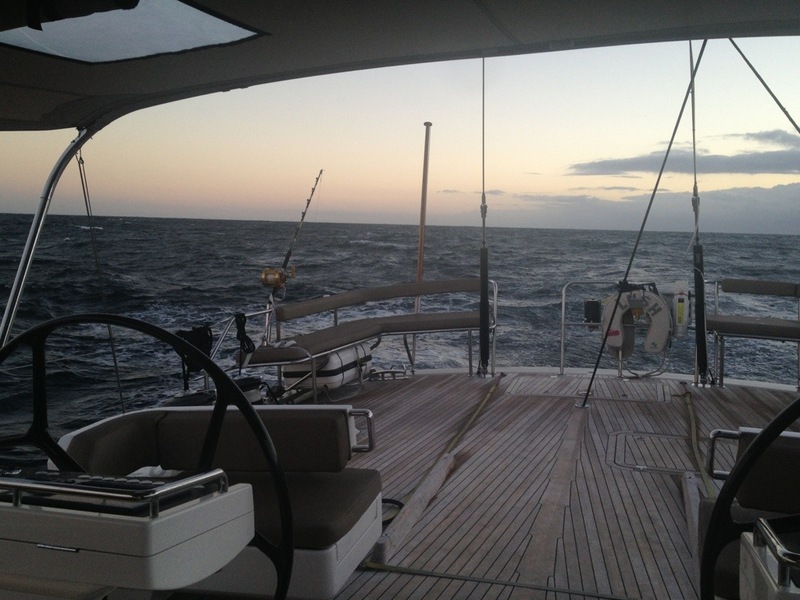 LUSH maxed at 18.6knots that night, we blasted through this Indian Ocean and arrived on Als birthday (29th) at 3pm. Our final fish score was 8 to Fish and 6 to LUSH, they got us and finished it off in style. We really have to hand it to them! And as for Als Marlin, well my guess is he’s back living it up in his Ocean and will no doubt stay clear of shiny pink squid for a while at least! 2nd hour, serious focus, skipper steers boat so helping Al keep tension in his line and stopping fish swim under the boat and snapping the line! Oyster notice LUSH takes a dive South! Fancy a trip to the Antarctic? This Marlin was not giving up! 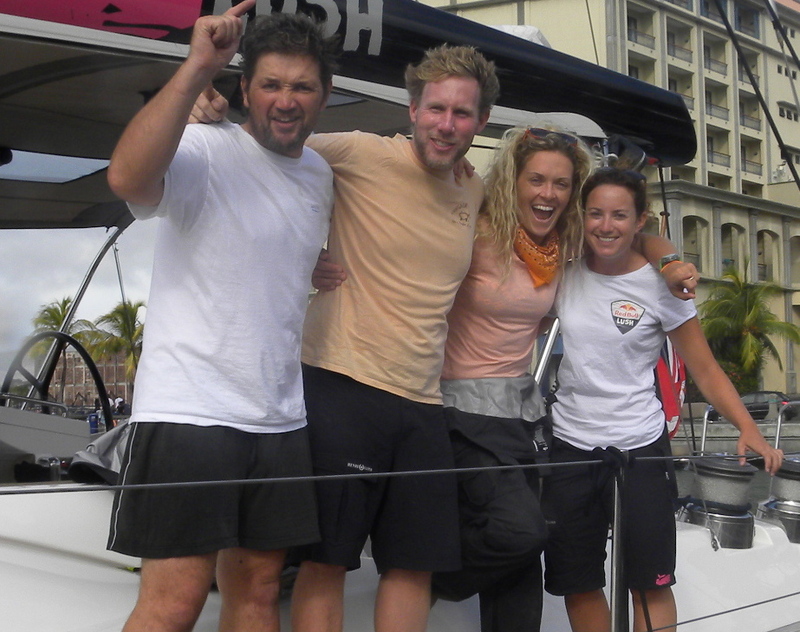 Salty sea dogs arrive in Mauritus after the final grueling 24 hours at sea! Certainly three of us were glad to be on terra firma! A Whale of a time at the St Barth’s Bucket! Speaking Engagements & Paul’s Exciting New Project! A Chef’s Journey: From Dentist to Superyacht Chef!